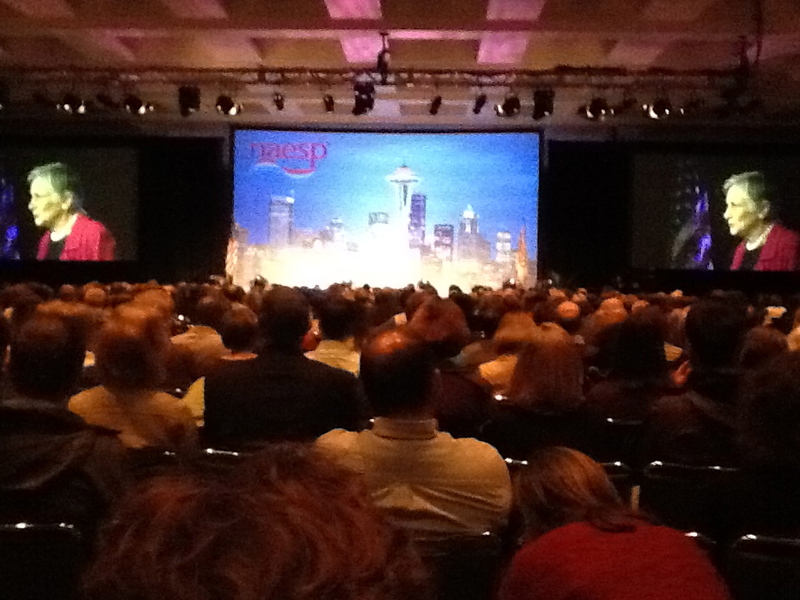 Diane Ravitch gives the opening keynote at NAESP 2012. 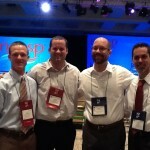 My personal learning network at NAESP. However, my inspiration was not solely from the speakers – much of my inspiration came from the brief but ongoing dialogue I had with 3 principals I met through Twitter: Scott Friedman (@irishscott), Christian Pleister (@cpleister), and Jeff Prickett (@jdprickett) – follow these awesome guys on Twitter – well worth connecting with them. I attended the conference alone but because of social media, I was able to connect with these educational leaders, along with a few others, to discuss the words of the speakers and how we could use the ideas in our schools and education systems. I have described before how my learning has been greatly impacted by social media… but I have to admit, although I was inspired at the conference, I was also very frustrated. After 3+ years of learning alongside others through Twitter and blogs as well as participating in 2 Edcamps, I have learned the importance of taking the time to reflect and engage in powerful dialogue around ideas in education. The schedule of this conference was similar to every other conference I have attended: keynotes and number of sessions compressed into a few days (although this conference had more “famous” speakers than any other I have attended). The problem I have with this format of session 1, session 2, session 3, session 4 is that there is no time to reflect and discuss the HOW’s of education- HOW do we take the ideas of these thinkers and create change in our schools? The Edcamp model allows a large chunk of time in between sessions for participants to dive deeper into the ideas. In addition, the sessions themselves are not about being a spectator but more of being an active player in the discussions. At NAESP, not only was there no time to connect with others face to face, but there was no wireless and thus, the multiple conversations that often occur in backchannels on Twitter was lost. There was also no lunch provided… I am not disappointed in this because I had to reach into my pocket to buy lunch; I am disappointed because participants dispersed into their own schools and districts so very few opporunities were there to connect with new people (but as I said, I was privileged to be connected with others prior to the conference through SM). At one point, as Andy Hargreaves was discussing innovation, I leaned over to Jeff and said, “how innovative is getting 1000’s of educational leaders in one place and have them… NOT talk for 3 days?”. Now, I am not being critical of NAESP as the speakers they brought in were educators that I had looked forward to hearing and as I said, I came away inspired… but I think it is time to truly challenge the traditional conference model of professional learning. The Edcamp model is one idea but I strongly believe that conference organizers just need to steal the collaborative idea of edcamps and build it into the conference. Instead of going keynote, session 1, session, 2… why not have rooms dedicated to those who want to collaborate and dive deeper into the learning and ideas presented by the keynote(s)? These areas could be completely free for participants to choose or could be focused on a specific topic or area of interest facilitated by an individual(s) determined prior to the conference. It is no secret that funding for professional development is down and therefore, attendance in conferences is down. I love the Edcamp model but I also think there is still a role for keynote speakers and session presenters. In addition to rethinking the entire methods of professional learning (professional development days, etc), it is time to rethink how we do our professional learning so it is more cost effective and more collaborative. It is time to rethink the traditional conference model. What are your thoughts on conferences and professional learning? Have you attended conferences that had a traditional conference model WITH time for collaboration? A special thank to all those I met at NAESP – the inspiration for this post is the slight disappointment we did not get to learn more from you. Great post, Chris. How true is this? As inspiring as the conference was, with the highlight being the professional networking and friendships created, the real work will be getting this frame of thinking into our districts. It is my hope that, through enhanced social networking and media opportunities, ideas like Edcamp are expanded. Think of the PD offerings in your own district. If they are anything like mine, then they are an exact replica of what occurred at NAESP 12. 21st Century Learning? Thank for making my conference experience a collaborative one, Jeff. 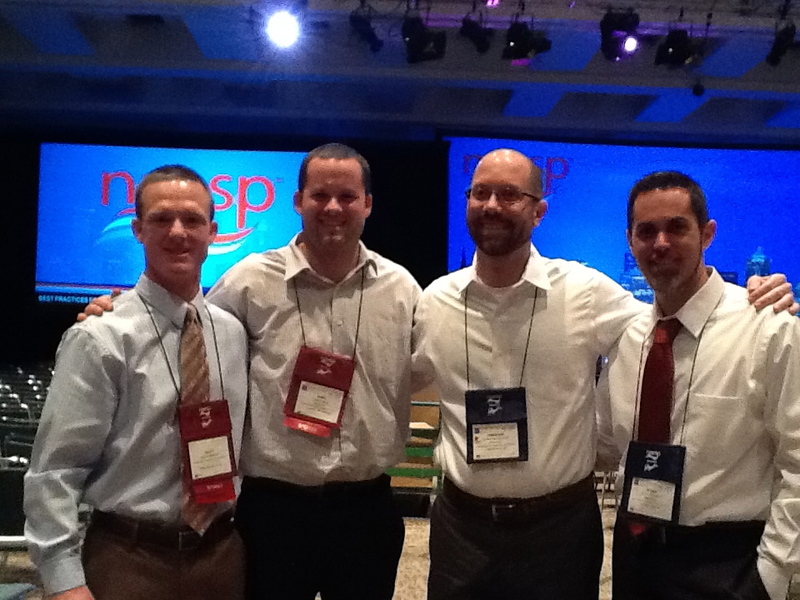 Also, it has been great to see that weeks later, we are still collaborating on ideas discussed at NAESP. Looking forward to more conversations! My conference experience has mostly been in science, not education – but I did get more out of some than others. The best interactions occurred at conferences where there were built-in social times – whether a lunch or an evening event (BBQs were always my favourite). As a student I was sometimes introduced to a new group each time. A yearly event for one society is an “Ice Cream Social” the night before the conference begins. Acquaintances are made or renewed over ice cream. I think built in social events give these conferences more of a small-town/family feel, even if the event was very large. One other aspect of many scientific conferences that enables interaction is that in addition to keynote/symposium talks there are research presentations. These presentations are often in 15 minute blocks, and in smaller conferences you can go from room to room to see specific presentations OR duck into an empty corner or hallway to discuss specifics with someone… a great way to begin collaborations! Thanks for adding tot he dialogue Wendy. At NAESP, they did have a few social events but most of us were so tired from being in sessions from 7:00-4:00 that we often just dispersed into our small groups. I like the idea of mini-sessions to increase contacts with others. The key for me is just that… the contacts and the conversations. 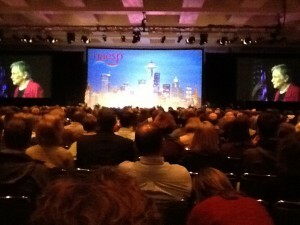 I attended a conference recently and heard a speaker on “brain based learning”. She made a very important point – whoever is doing the talking is doing the learning. She modeled this in her session. This simple and powerful point needs to embraced in our classrooms and in pro-d.
Agree with Chris and your reflections as well. The sessions did not model the opportunities for dialogue and reflection that we would expect to see in classrooms! Appreciate the work you put into your presentation, Chris. Well said, Johnny… time for deep reflection is important.. with the opportunity to discuss this with others. I really enjoyed connecting with you in Seattle. In fact, networking and making connections is usually a primary factor to attending such conferences. I stayed in touch with 4G service, but the lack of wireless was an issue. I agree that the conference model needs to grow just as the classroom. The session I co-presented was a hands-on session, and we had to fight tooth-and-nail to have tables in our room. As educators, we know that change is hard. Without being a Debbie Downer, I really enjoyed myself. I do see, however, that we must model at conferences what we want to see in the classroom; interaction, collaboration, communication, critical thinking, and sometimes even physical movement. No more “sit and get” presentations for me! Well said, Kim. I agree that I really enjoyed the conference and all those that I formed connections with. However, as you said… time to evolve conferences as we would like to see in classrooms. I still love a good keynote… but I also love chatting with the HOW with others afterwards. Thanks for commenting! As a new BC school trustee, and as a career development practitioner, I’ve been to several conferences over the past few months and I’ve experienced much of the same thing you have described – and have shared that very feedback with the pro-d committees. We need to embrace 21st century skills conceptually into our pro-d and conferences. At one conference, we had no wifi yet had a live Twitter feed in the main area, broadcasting our tweets. As someone who believes strongly in reflection, I wonder if we couldn’t all add an online piece to connect with our f2f speakers and even have SME’s facilitate the learning and discussion that ensues. I’ve been following your tweets with interest lately and will now add your new colleagues, as I appreciate what you are sharing here. Thanks Chris for sharing your thoughts and experiences. I’d actually like to hear more about what you think would make an ideal conference, beyond what you have said here. Chris in 2005 I gave a class for the Mi Cosmetology schools Association; the speakers and textbook companies lead and preach about “engaging” our adult learners and then use a “fill in the blank” presentation! I wrote a presentation for the Educators that modeled ways to create engagement & OMG mixing them up to work with new peers was like pulling teeth but we shared new ideas and different ways to create more interactive lessons. Last year I attended the conference and they’re back to fill in the blank. My point when you are presenting for Educators you need to MIRROR the ideas and techniques that you want to get used back at home!Change the way you engage, to create change! Chris, you did a great job of summing up our conversation. The connectedness piece of the conference was the most valuable part of the experience. I hope conference formats evolve as we evolve in our schools. It’s time to take the next step! Excellent post! 1st off I have a hard time believing there was no wifi, that I have not experienced at a conference thankfully. I completely agree that something needs to be done and something needs to change. I recently attended my 2nd edcamp in Omaha and loved it! I love the collaborative, discussion based aspect of it. Soon I will attend our annual Nebraska Technology conference which will have keynote speakers and sessions like you mentioned. Some of my twitter PLN like @j_allen & @Mrskmpeters are attempting to add an edcamp feel to that conference and I welcome the change. I agree I sometimes want to be inspired by a keynote, but at the same time in this day & age I want to connect with people as well. As @irasocol said at a conference where he was speaking “we have to stop meeting like this.” The current conference model feels and falls flat if you either know or intuitively understand the research of Joyce and Showers. While a speaker may inspire or re-energize, it’s through group processing, connection, interaction that learning and transfer into practice occur. Educators who desire to evolve, shift, change feel short-changed when conferences stop short of opportunities to search, connect, collaborate and create. Social media have created an ongoing opportunity to do that with others virtually while #edcamps offer that in a f2f learning space. Trad conferences sustain a culture of isolation – with little chance of gathering around campfires to share stories or at watering holes to exchange, trade, and barter ideas and resources. The 21st c human yearns for pre- Gutenberg moments, an evolution back to search, connect, collab that’s so much more than print, read, write in the teaching place. if you’re thinking of organizing a conference similar to what @davidwees proposed in this blog post (http://bit.ly/KheIYP ), I’d love to help. Keep me posted. I am looking forward to attending edcampomaha in 2013. As my building’s staff development facilitator I am hoping to add a bit of an edcamp feel to some of our training tihis year.